"Generally, rangers are highly undertrained, undersupported and not respected," said Barney Long, former director of species conservation for the World Wildlife Fund and now with Global Wildlife Conservation. "We put people in charge of these valuable resources and yet we don't look after the people who are taking care of them." What motivates a ranger to do a job with low pay, long absences from family and the risk of life-threatening attacks? UCF researchers are working to answer this question in collaboration with the WWF, a leading international conservation organization headquartered in Washington. The team's findings are published in Oryx: The International Journal of Conservation. "This is a completely new area of investigation for the WWF and really a new topic within conservation sciences and policy," said Will Moreto, UCF assistant professor of criminal justice and the lead author of the new study with Long and others on rangers working in Asia. "You need to understand the day-to-day realities of rangers if you want to develop a ranger force that is motivated and effective in conservation," he said. Moreto established himself as a researcher with interests spanning crime and conservation as a doctoral student at Rutgers University. His dissertation research focused on law enforcement rangers and poaching in Uganda. Long learned of Moreto's work and contacted him about a new WWF project on rangers. The organization was planning to survey rangers about their jobs, and Long invited Moreto to help develop the survey questions and examine the data. From January to July 2015, data collectors trained by WWF employees and other partners met with hundreds of rangers in Asia to obtain their responses to 10 questions, most with subparts. Some rangers submitted their responses by email and postal mail. In all, the WWF obtained responses from 530 rangers working in 39 conservation areas in 11 Asian countries - Bangladesh, Bhutan, Burma, Cambodia, China, India, Indonesia, Laos, Nepal, Thailand and Viet Nam. At UCF Moreto partnered with two criminal justice colleagues to analyze and interpret the data. Associate professor Jactina Gau contributed expertise in statistical analysis and professor Eugene Paoline shared his insight on law enforcement culture. The survey asked rangers to rank nine job aspects according to what most and least motivated them to continue working as rangers. Moreto and his team tagged each aspect as being either intrinsically motivated (affected by internal influences) or extrinsically motivated (affected by external influences). More than 47 percent of rangers selected "I have no other job option" as the aspect that most motivated them. They ranked having good promotion prospects and liking the power and authority of the job as second and third, respectively. All are extrinsically motivated aspects suggesting they are under the control of administrators of protected conservation areas, reported the authors. More than 47 percent of rangers selected "I enjoy being close to nature" as the aspect that least motivated them and 43 percent selected "I enjoy being a ranger" as second. Both aspects are considered intrinsically motivated. The survey also asked rangers if they would want or not want their children to become rangers and why. Rangers who were adequately equipped for the job were much more likely to want their children to become rangers, a finding that underscores the importance of work environment to rangers' job commitment. The top reasons rangers did not want their children to become rangers were low salary and no reward for hard work. "If you wouldn't recommend the job to your children, you probably wouldn't be motived to recruit others," Moreto said. "You wouldn't be a good representative in general. "The WWF expanded its study to include rangers in Africa and Latin America, and Moreto and his team are examining this data as well. They also are involved in a more in depth study of rangers that includes a 120-question survey. The ultimate goal is to bring policy changes, said Rohit Singh, a WWF wildlife enforcement and capacity building specialist, president of the Ranger Federation of Asia, and coauthor of the study led by Moreto, in a WWF interview. "National governments have to take the initiative. We need to provide them with good, concrete, scientific data, and advocate for the policy changes that can improve ranger conditions," Singh said. 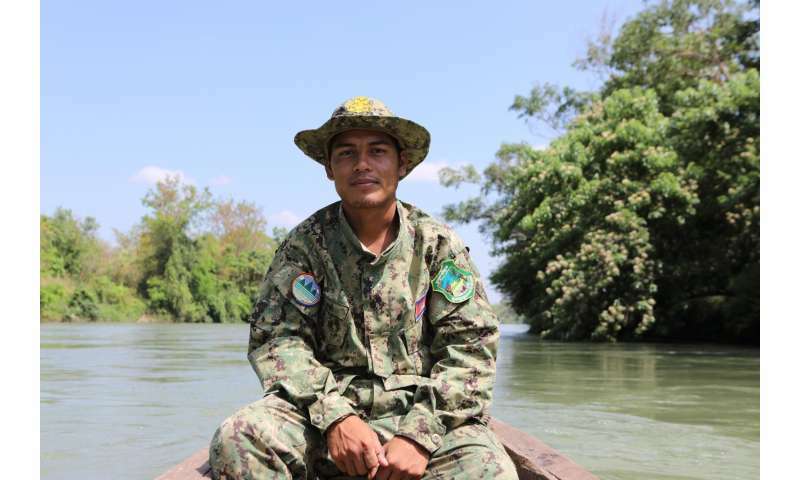 "The future of wildlife and forests depends on rangers."